This section relates to basement problems where no visible water is present. Basement Dampness: It is not unusual that a basement is damp but has no signs of visible liquid water leakage. Many times that a homeowner complains about “dampness” issues in their basement, it is directly related to humidity problems. If you don’t see actual liquid “water” in the form of streams, puddles or leaks, chances are pretty good that your problem is related to high humidity and not to water leakage. Remedy: Buy a good dehumidifier for your basement. 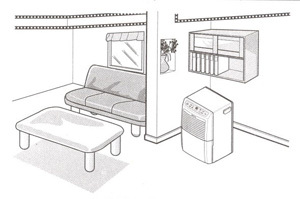 Because a basement is below ground level, the air, walls and floors are “cooler” than the temperatures upstairs. Warmer air from upstairs or from outside, shrinks or “condenses” as it enters your cooler basement. This leads to a higher humidity level and causes basement dampness. A dehumidifier will physically remove the extra moisture from the air, allowing your basement to dry-out through evaporation. Even a basement that doesn’t leak can benefit greatly from using a dehumidifier. Keep all doors and windows in the basement closed year-round. Open doors and windows allow more humid, moisture laden air to enter the basement and cause problems. Rusty Metal Tools, Appliances, etc: Metal is a conductor. Because your basement is below ground level, it will be cooler than the upstairs and so will everything you store in it. Metal objects will lose their heat quickly because of their conductive nature. When warmer air from upstairs or from outside enters your basement, it quickly shrinks or “condenses” as it comes into contact with metal objects. This condensation process allows moisture to collect on metal surfaces causing them to rust. Remedy: Buy a good dehumidifier for your basement. A dehumidifier will physically remove the extra moisture from the air, allowing your basement to dry-out through evaporation. When the humidity level is dry enough, your tools, appliances and other metal objects will no longer continue to rust. Even a basement that doesn’t leak can benefit greatly from using a dehumidifier. Keep all doors and windows in the basement closed year-round. Open doors and windows allow more humid, moisture laden air to enter the basement and cause problems. 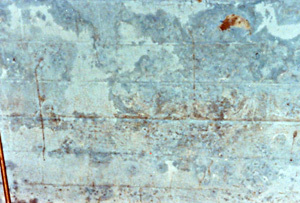 Peeling Paint: Paint peeling off or bubbling in the basement is a common problem. Paint peeling off can have 3 or more causes. High Humidity – If you look at dry paint under a microscope, you’ll be surprised to see how “porous” it really is! The masonry walls and floors behind the paint are also porous. 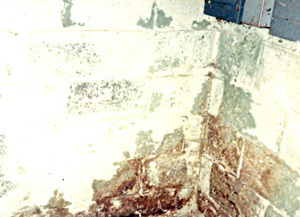 When a basement has a high humidity or dampness problem, moisture wicks through the porous surface of the paint and is absorbed into the masonry behind it. When temperatures become warmer, the moisture behind the paint turns into steam and forces the paint off from behind. Also, because moisture is absorbed into the masonry surfaces behind the paint, the water soluble ingredients in the masonry are leached out and crystallize as they dry. As crystals form, they force any coatings off the surface. Improper Surface Preparation – Professionals will tell you, “The most important part of any painting job, is the surface preparation”. If a surface to be painted is not completely clean, dry, etc., the paint is not going to adhere to the permanent surface underneath. Paint on top of dirt, grease, etc only adheres to the dirt, not the surface underneath. Remedy: Read the “SURFACE PREPARATION” instructions that come with the product you buy. Follow all cleaning, etching and drying instructions completely. PRIMER is also extremely important. Do not skip this important step! Sealers and other coating do not adhere well to bare surfaces. Primer is made to adhere to the bare surface and provides a superior adhesion surface for your top coat. Buy Quality Paint - As the old saying goes, “you get what you pay for”. Remedy: Buy a top quality coating. The labor putting it on is more costly than the material itself. Don’t skimp on price. You can get good purchasing advice from consumer magazines like Consumer Reports and other entities that test products for consumers. Many times, the only advice you get from a particular paint store is, to buy one of the products they sell. Be aware that most paintable coatings will come with a very limited warranty. Read your products warranty coverage carefully. Musty Odors: Because your basement is below ground level, it will be cooler than the upstairs and so will everything you store in it. When warmer air from upstairs or from outside enters your basement, it quickly shrinks or “condenses” as it enters the basement. This condensing of the air volume, raises the humidity or raises the amount of moisture stored in the air. Everything porous in your basement, cardboard boxes, furniture, clothing, carpeting and even the masonry itself, “absorbs” all this moisture. The high content of moisture is the breeding ground for musty smells. Remedy: Buy a good dehumidifier for your basement. A dehumidifier will physically remove the extra moisture from the air, allowing your basement everything stored in it, to dry-out through evaporation. When the humidity level is dry enough, your tools, appliances and other metal objects will no longer continue to rust. Even a basement that doesn’t leak can benefit greatly from using a dehumidifier. Keep all doors and windows in the basement closed year-round. Open doors and windows allow more humid, moisture laden air to enter the basement and cause problems. Look in your Yellow Pages for carpet cleaning companies or even smoke, fire and water damage companies. These type companies will usually offer services to clean the porous materials and surfaces in your basement. Often times, they can apply an odor neutralizer that can get rid of some of the more resistant odor problems.